How exciting to find a podcast discussion about Amanda Maier with Oxford University's Leah Broad on the Notes on Notes Podcast! After listening to the podcast you might find it interesting to read through the more than a dozen posts I have made about Maier during the past decade. You can find them all here. 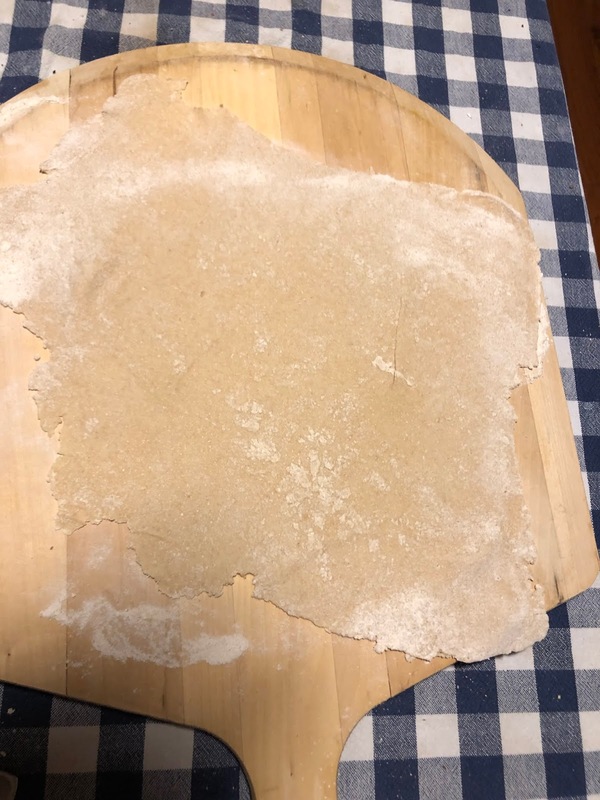 I had a burst of insight the first time I made Matzo for Passover. 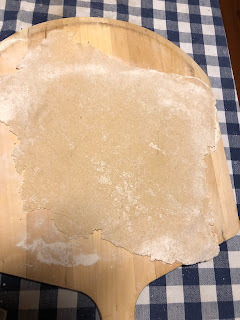 It must have been around twenty years ago, a time when there was no Matzo to be had in my town during Passover (not to mention no internet for guidance). So I decided to make some myself. I knew the ingredients: flour, water, and salt. 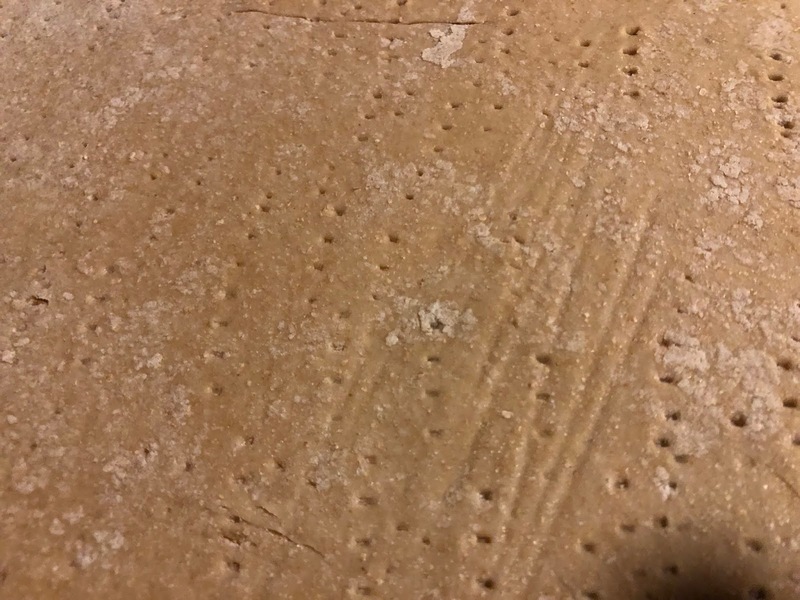 I knew that the Matzo had to be thin, and I knew the oven had to be hot, but I didn't know much else. What surprised me that first time was how quickly the dough would try to rise even though it didn't have yeast added to it. I understood at that point that before the Exodus making Matzo probably wasn't a matter of not having enough time for bread to rise, as we have been led to understand. It was a matter of preparing the best road food. The people who wrote the first set of Passover instructions were probably not bakers. They probably didn't know the ways of dough. In order to make Matzo work you have to be fast. 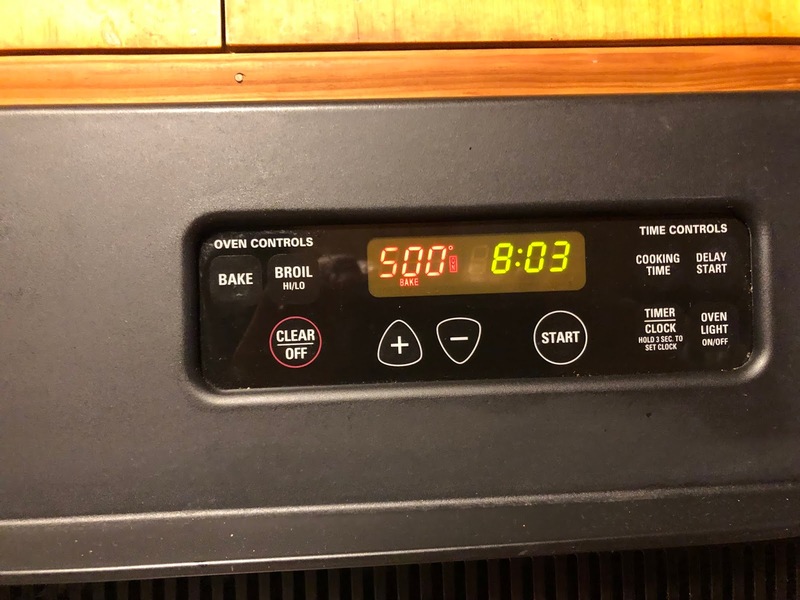 You have to have the very hot oven ready. 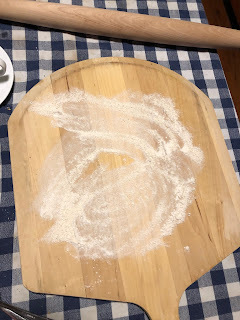 You have to handle the dough minimally: just enough to be able to roll it out so it is very thin. 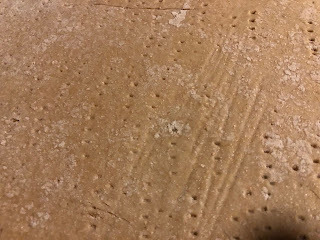 You have to have something (I used two forks) ready to make the perforations in the top that keep the Matzo flat. 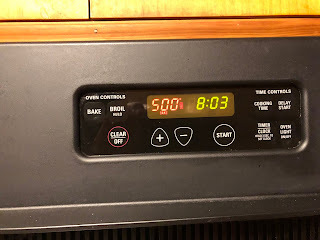 You have to pop it in the oven, watch it (listening to the hiss of the steam as it escapes through the holes), and take it out before it burns. I read that the natural yeasts start doing their work at about eighteen minutes. 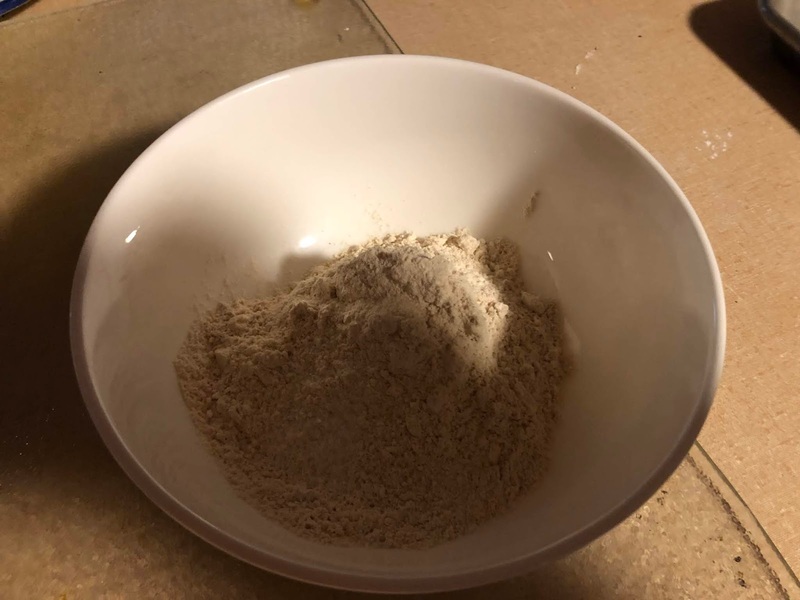 In our house the natural yeasts in my Prairie Gold white whole wheat flour start doing their thing instantly. 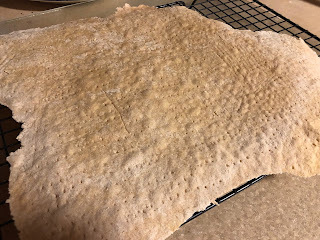 I would say that making one sheet of Matzo, including cooking, took about eight minutes. 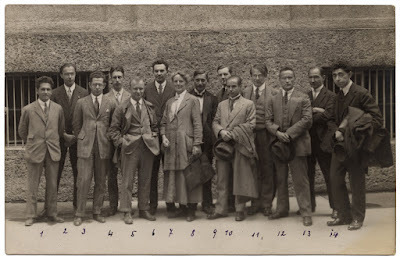 Number twelve (front) is Anton Webern. Please help identify the rest! And while I have your attention, here's another post with another photo of Hindemith (from many years later) with a bunch of composers (his students at Yale). A few still need to be identified. And HUGE thanks goes to Steven (in the comments) for finding the answer! 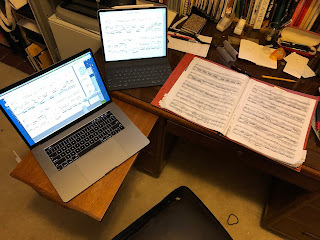 I like to think that I am part of a large musical community, but, even though I play with several ensembles, teach (or have taught) a lot of students, and write music that is, more often than not, played by people I do not know, I am mostly a person who works alone. I imagine that there is an enormous community of composers, writers, visual artists, and inventors who work in isolation. We live in imaginary worlds where our subjects, characters, themes, and widgets relate to one another inside of our individual heads. 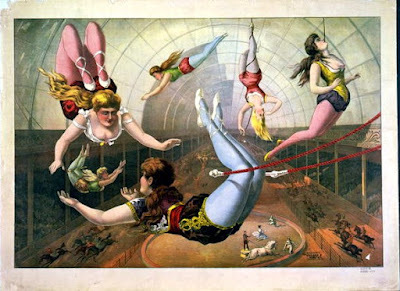 In my opera-writing days I used to think of it as the theater inside my head. But we isolated dreamers like to share our stuff with the insides of other people's heads. Coming together to make music is a real joy. But it takes work to arrange to come together, and it sometimes involves personal risk. Sometimes it involves personal friction. I have, over the decades, been in organized musical situations that I have had to leave. I had to leave my teenage musical community because we all went our separate directions once school was over. I had to leave my Juilliard/New York musical community for personal and professional reasons. 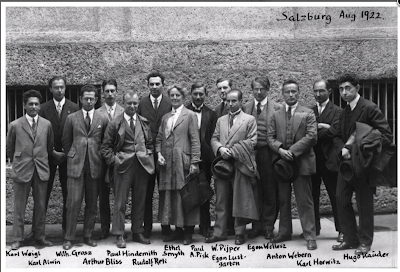 I had to leave my musical community in Schladming, Austria because I could not work under the psychological realities of that small town, and I had to leave my musical community in Vienna because, as a woman, a flutist, and a foreigner, I could not get adequate work there. I had to leave my musical community in Hong Kong because I could not extend my work visa, which ended up being a good thing both personally and logistically because the Hong Kong I lived in no longer exists. I did not have much difficulty leaving my musical community in Boston because, upon returning after my years away, I didn't have time to establish a strong musical community there. Besides, I was excited to go off on a Midwestern adventure with my new husband. The musical community in my new town was welcoming and vibrant, but, being a university town, people I grew close to would leave. And then, since we are all human, people I grew close to would die. Now I only know a few members of the music faculty at the university. I still make music with a healthy handful of friends, but I feel a distance from the organized musical communities that have developed in my town. I have spent decades building my own musical communities, but I know that if I do not do the work to promote and sustain them, they might cease to exist. When Facebook came around I had a magical way of pretending that I was still a member of all those musical communities: the musicians I grew up with, the musicians I went to Juilliard with, the musicians I knew in Austria, the musicians I knew in Boston, and the musicians who used to live in my town. I thought that I might retain some of the connections to people I interacted with "there," but I haven't. I don't have email addresses or phone numbers for people I used to "know" "there." I wonder if any of the people who I was "friends" with on Facebook read this blog? I recently had to leave an organized musical community in another town that I loved being part of. I had to do it because of an embarrassing and insulting situation regarding a dear friend. I had no other choice than to put long-term friendship over organized musical community. I do not regret my decision, but I feel a great deal of sadness. So I'm using this space to share my feelings, and hopefully I will be able to get to a place of closure. Meanwhile, I guess I have scales to practice . . . I have a big birthday coming at the end of the month. 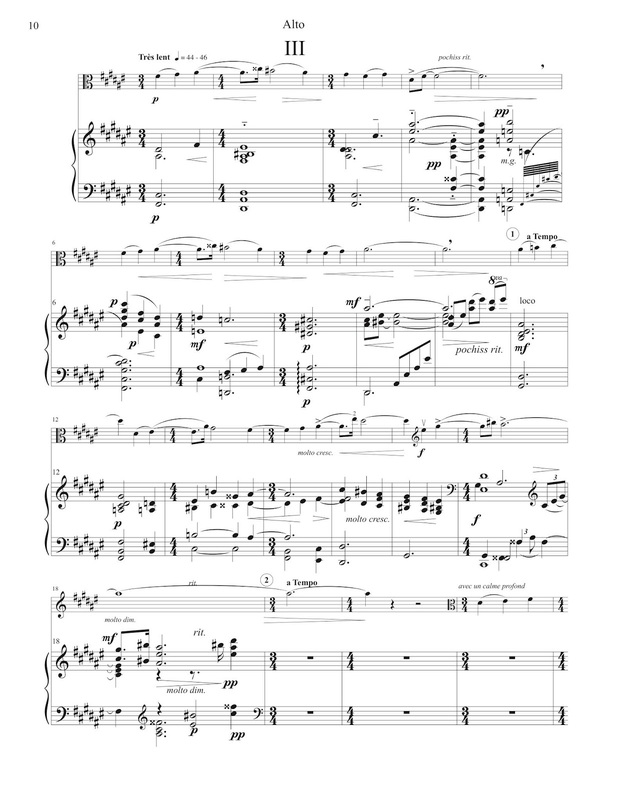 I started a series of "Birthday Pieces" for viola d'amore and piano when I turned fifty. The first piece has fifty measures and lasts about a minute. 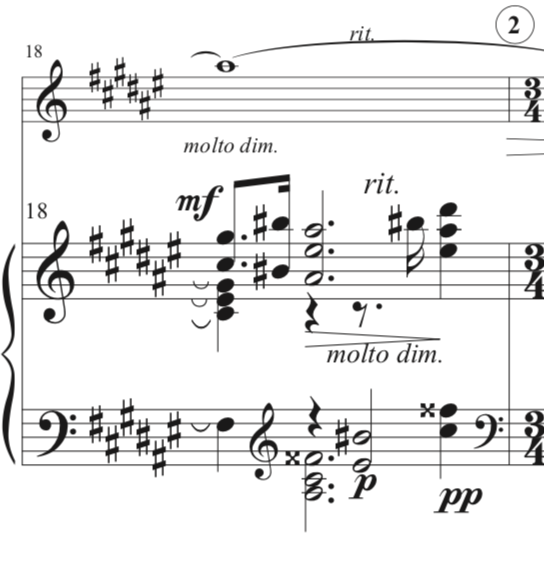 Every year around this time I write a new birthday piece for viola d'amore and piano, and I add one measure for every year. This newest edition (which you can listen to here) has sixty measures, and it lasts about four minutes. I have noticed, during my almost sixty years as a human being, that I'm a creature of unconscious regularity. This multi-year project provides me with some conscious regularity. It also provides viola d'amore players with some new repertoire. The series will continue as far into old age (or second youth) as I do. Here's a link to the music in the IMSLP. And, if you are interested, you can find all eleven pieces here. My practicing is always better when I have a clean piece of music to work with. I used this lovely painting by my mother for the cover of my viola transcription of Dora Pejačević's Cello Sonata, and have loaded it into the IMSLP. I think my rebellious mother would have liked the (possibly) equally-rebellious Pejačević, so their work is now joined together in the unusual ether of an on-line music library that is freely accessible by all. Maria Theodora Paulina Pejačević’s father came from a noble Croatian family. Her mother was a Hungarian countess. Pejačević was born in Budapest, spoke many languages (though not Croatian), and identified culturally as German. She played violin and piano, and began writing music at the age of twelve. She had considerable success as a composer in Germany, and after the First World War she reacted strongly against her class, and was left socially alienated. In 1921 Pejačević married Ottomar von Lumbe, a German military officer; two years later she died from kidney failure, just a few weeks after the birth of her only child. Nearly all of Pejačević’s fifty-eight known compositions (vocal works, chamber music, piano music, and orchestral music) are housed in the Croatian Music Institute in Zagreb, and some have been published by the Croatian Music Information Center. Her music is catching on, and there is now more Pejačević on YouTube than is practical to link to in this post. Her Symphony in F sharp minor is a good place to start. And you can find more of my mother's work here. Yesterday afternoon I was listening to the radio while driving to hear my seven-year-old student play a Bach piece at a local beauty pageant. She was the reigning 2018 Little Miss of our town. She won her title last March, and she started playing the violin in September. This was her first public performance. Ever. There was a person on the radio talking about how the laws of physics showed that there is no past or future, and that in some parts of the universe time could even go backwards. Interesting. This was all spoken over a performance of the Prelude of Bach's Second Cello Suite. I wondered if it was supposed to prove a point about Bach and time or about time and music, but I was disappointed to realize that the Bach just served as background. Then this person started talking about chaos and order. He said that there are many kinds of chaos, but only one order. He said something about the laws of physics backing up that claim. His example was that if you clean your house it inevitably gets messy again. He then went on to explain that conditions had to be just right for the big bang to happen as it did, and he mentioned something about the original smoothness of the Earth that I didn't understand. Then he used the word "design," so I then suspected that his argument might have had something to do with trying to put the geological record of the big bang into a religious creationist's worldview. 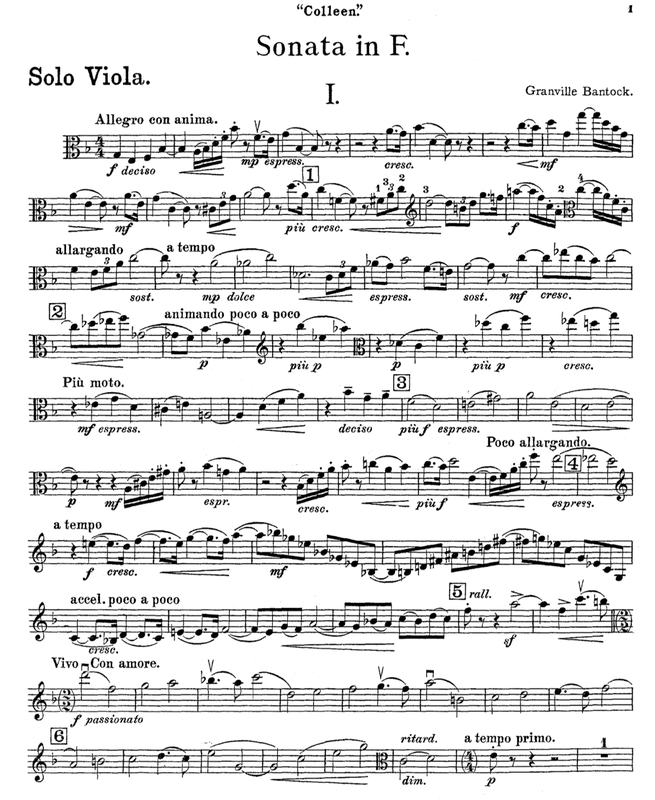 I tuned him out, and started thinking about the Bach cello suite (another movement from a different cello suite was playing in the background this time) and that the greatest gifts Bach gave to musicians are the many "right" ways his phrases can be played. His music is a gateway to infinite musical possibilities. When we play solo Bach, every experience (musical and non-musical) can inform the way it sounds or feels to play any phrase at any given moment. 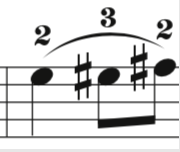 The counterpoint inside each of our heads while we are playing Bach's pitches and rhythms is always different. For the Ancient Greeks the word "chaos" meant emptiness, which eventually got translated into the King James Bible as void. It was first used to mean disorder by the 16th-century English satirist Stephen Gosson, and then much later became used to name a branch of mathematics. When we write music (or anything for that matter) I don't believe that order comes out of chaos in either sense of the word (I don't know enough about mathematics to weigh in on that meaning). There is no "void" because we are living and breathing people with senses, experiences, and ideas. And writing is effectively lining up ideas so that they make sense. I don't think of putting ideas together as creating order out of disorder, though I sometimes create disorder when I put ideas together. My student played very well. The person doing the announcing introduced her piece as being by Jonathan Sebastian Bach, but very few people in the audience noticed. 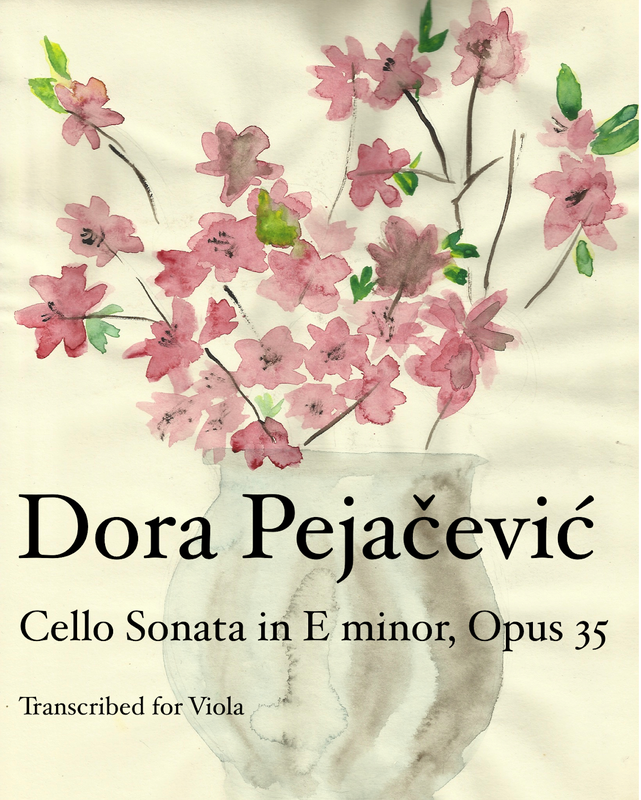 We are playing a viola transcription of a cello sonata by the Slavonian composer Dora Pejačević (1885-1923). It is one of fifty-eight pieces that she wrote in her short lifetime. Pejačevic died a few weeks after the birth of her only child. 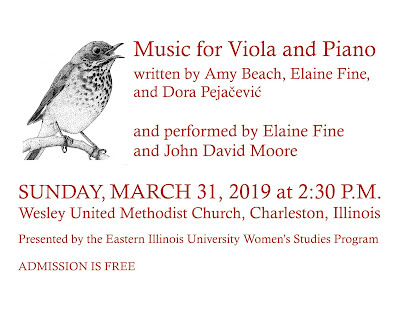 The song of the wood thrush (the bird on the concert announcement) is represented in two solo piano pieces by Amy Beach. And the piece of mine that we are playing is a traditional sonata made from interspersing frog songs and songs about frogs. Sometimes I wonder if reruns provide an unconscious soundscape of late-boomer's compositional lives. Could the music for "Star Trek," "Lost in Space," "Bonanza," "Lassie," "Mission Impossible," "F-Troop," "Gilligan's Island," and "I Love Lucy" function the way the songs of birds did for Messiaen, Dvorak, and Sibelius, or pub songs functioned for Brahms? I started thinking, once again, about how rarely I listen to CD recordings and how much I enjoy NOT listening to them in order to write reviews for publication. But then I realized that I have nothing new to say, so I bundled a bunch of posts together from the past ten years or so. Some come from a time when I was still reviewing recordings, and some are from after I stopped. If you ever wonder what might go through the mind of a record reviewer who is also a musician, here's your chance! Who is the music for anyway? I was working with a teenage student on a Handel sonata the other day. While trying to get her to make things musically exciting during periods that did not have fast-moving notes, I mentioned that Handel wrote the piece for her enjoyment and as a vehicle for her to express herself. Of course Handel didn't know my student, but he knew the "audience" for his published music would be musicians looking for music to play with their friends and families. He was writing this music for people just like her. Lately I have heard teachers try to inspire students to play with expression by telling them that it is their job to project the composer's intentions to the audience. There is nothing really wrong about this way of thinking, but there is something odd about it. People do write music that is concrete and programmatic (Beethoven's Sixth Symphony, Vivaldi's Four Seasons, for example). Instructions can be given as text, or pieces can be written in genres with certain expectations (nocturnes, waltzes, marches, lullabies, etc.) Programmatic references are necessary when writing music for opera, ballet, and movies, because the music needs to support what is happening. It also serves as a practical way to maintain the pace of the narrative. I suppose music with a text (a song, a song cycle, or a choral piece) or a tone poem would fall into the programmatic category. I believe music for the stage is written for the benefit of the audience (as well as the benefit of the composer). A person watching a drama ideally wants to "turn off" the drama in their own lives and "escape" into the drama of the production. Sometimes composers do too. It is different when the music at hand is not programmatic. When I write non-programmatic music I don't think about the specific emotions I want an audience to feel, but I do think (constantly) about how I want the people playing the music to feel. I want them to feel comfortable expressing themselves, and I want them to feel comfortable interacting with one another. I find that when passages do not sit well on any instrument, a lot of expression is lost, so I strive for physical comfort. I also work to organize the music so that the people who play it remain interested and engaged. In the case of non-programmatic music, the melodic and harmonic material, tempo indications, rests, slurs, articulations, and dynamics can be written into the music. All the stuff that remains (i.e. the music making itself) belongs to the people playing the music. People listening can decide what to pay attention to. If a performing musician wants to call special attention to something in the music and people in the audience notice, that can be a good thing. Or not. We often listen to music to be entertained, and we often play music to entertain ourselves and share with others. If a professional musician has had a lousy day, his or her negative feelings and pesky "self talk" are imperceptible to the audience. Nobody can hear the words that are in your head while you are playing, and nobody who is playing can "hear" the thoughts of the audience. Imagine the distracting extra-musical cacophony that would happen if you could. But if the chatter in our heads is redirected towards the music at hand, people who are playing together can connect with one another in very intimate and inexplicable ways through the music. In doing so, they also connect with the other people who are in the room, and those people can feel connected with one another in the music. And, for some people, their inner chatter might slow down. Or even stop. These are the moments musicians live for. I aspire to write music that makes these moments possible. I imagine a lot of composers share that aspiration. There's a Yiddish folk story about a couple with six children cramped into a one-room hut. When the father asked the local Rabbi for advice about how to get along in their small space, the Rabbi advised him to bring the family's chickens in the house. When the father complained to the Rabbi the next week that the chickens were not making things better, the Rabbi advised him to bring in the family's cow. The next week the Rabbi told him to let the horse in. This went on for a while. The father was in despair. The Rabbi finally told the father to let the animals out. The next week the father thanked the Rabbi, and said that his house was now peaceful. This is how I feel about no longer participating in Facebook. It has been ten weeks since I deleted my account. I was worried at first that I would miss out on what was going on with our children, but we talk on the phone all the time. I worried that people wouldn't know about the concerts that I was playing. But I always let people know about concerts I'm playing by way of email. I have learned that I don't reach any "new" audiences through Facebook. I have often observed that an "event" on Facebook is often something people may show public interest in, but then they forget about writing down the information, and therefore don't attend. I was worried that my social world would get smaller. It has. But I'm not unhappy about it. I tend to enjoy the time I spend interacting with people more. I can always reach my friends through email. The best thing for me is the amount of time I now have to spend doing the things I love to do. 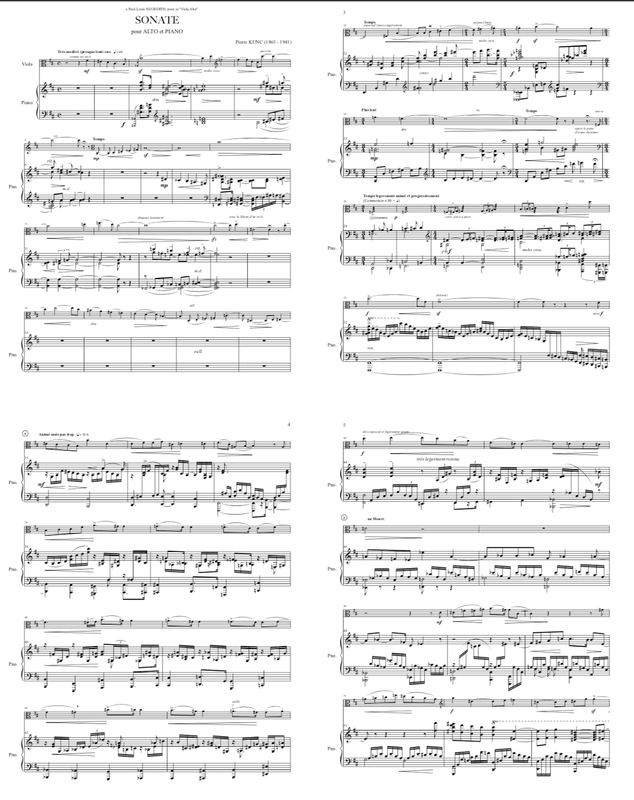 Since leaving Facebook I have written some good music (I've shared some of it here), and I have completed the huge project of performing and engraving the Kunc Sonata. I have posted about it here, but somehow it does not feel like careerist self-promotion to post things here. On Facebook it does. I suppose that is because musicians so often use Facebook to promote their careers. I remember listening to a podcast about musical careerist stuff where the "career advisor" suggested "friending" people on Facebook, and then "unfollowing" them. That way, she advised, people will see you, but you don't need to see them. I have come to understand that this kind of thing happens all the time. I'm interested in relationships that are honest. I like situations where I see you and you see me. I fear Facebook-based interaction is becoming more the norm. As for careerist aspirations, I have none. I love playing music with my friends and colleagues. I love playing concerts, and I love playing "gigs." I enjoy getting paid when I play with professional musicians, and I enjoy playing for fun with amateur musicians. 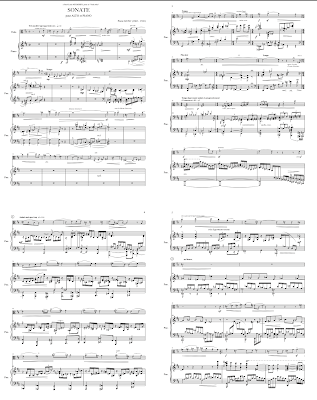 I enjoy getting paid to write music for people, and I love writing music that I can share in the IMSLP. My greatest aspiration is for quality, both in my playing and in my writing. Measuring quality in "likes" is terribly unhealthy for me. It is a trade-off. I suppose that if I worked the social media (and regular media) angles more, I could have more of a "career" as a composer, but I don't want to compromise my time. I want to spend the time I have doing the things I love, not the things I don't like to do. During the month of March people in the press start paying special attention to music written by women. But this March there seems to be a bit more going on than in previous years. There's an article by Susanna Eastburn in The Guardian that presents the idea of dealing with the problem of underrepresentation by women in the larger landscape of concert programs through gender equality. She runs Sound and Music, the UK's national organization for new music. Sound and Music has made excellent progress, and aims to have 50/50 gender equality in their musical programs by March of 2020. Things are slowly getting better for living composers who are female. Visibility helps. Orchestras and other musical organizations that take the "risk" of playing music by composers who are contemporary, living, and female show their audiences (and their musicians) that "classical" music is NOT only written by men from Europe who are no longer alive. These internets are finally buzzing with excitement about Florence Price. There's a review of a Naxos recording with two of her symphonies, and Spotify has thirty tracks on their "Composer Weekly" page for this week. Price is also featured in an excellent New Music USA blog post by Douglas Shadle, which discusses her as both a female composer and an African American composer. Most of all Shadle presents her as a great composer, which she certainly was. Thank goodness her music is now getting performed, recorded, and written about. These are not "baby steps." They are broad strides that are being taken by men and women that help enrich our musical world. 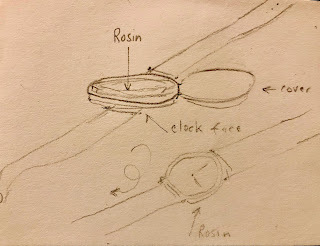 Very early on in my musical life a singer friend told me that she had to build her vocal instrument in much the way a violin maker builds a violin. There are people who are naturally gifted with beautiful voices, but to make a voice project requires serious training. I have always wondered how trans people who sing (and their teachers) deal with the vocal-instrument-specific changes that happen when taking hormones. I was so happy to find this article by Joshua Kosman in the San Francisco Chronicle. The article includes a clip of the Bass-Baritone Lucia Lucas. She trained as a baritone before going through transition, and was able to keep her voice and her career, now dressing up to play male roles. But I imagine that she has her challenges. I'm planning to read her blog, which I'm linking to here and on the sidebar. I found the post she made about how to learn a role efficiently particularly fascinating. I was seriously disappointed when I found that the ipad is not capable of turning the orientation of PDF files (like the ones available on the Werner Icking Music Archive or the Petrucci Library) from landscape to portrait. 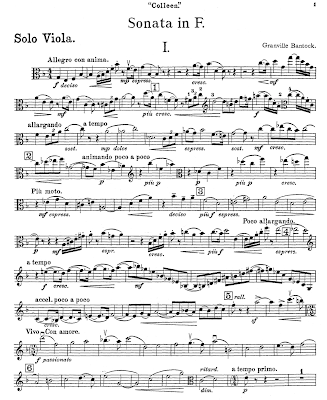 I also found that it is not possible to conveniently turn pages or even conveniently scroll through music. Using the Forscore program on my iPad, which I can use in landscape or portrait orientation, I am able to make corrections (in red!) directly on a PDF file, and then I can transfer those corrections into my Finale file. 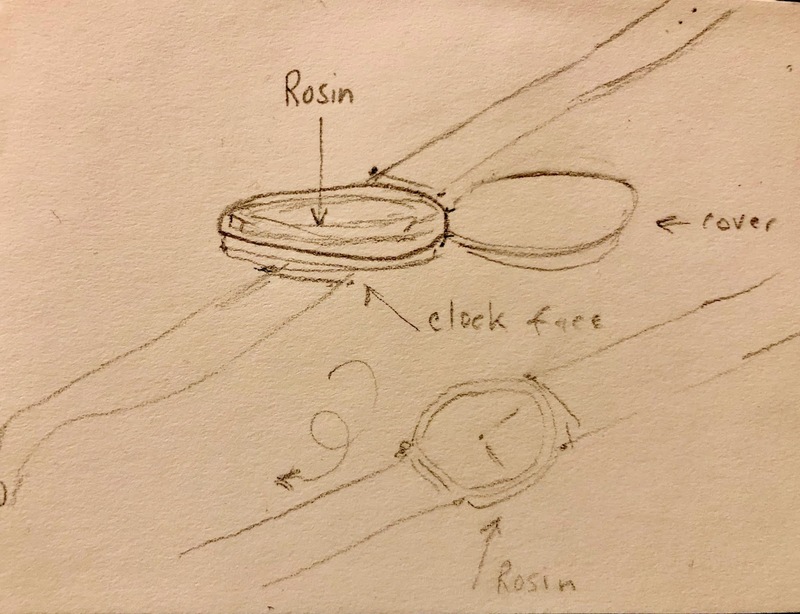 The display is clear, and it is very easy to see the kinds of details that I often miss when working with paper and red pen. 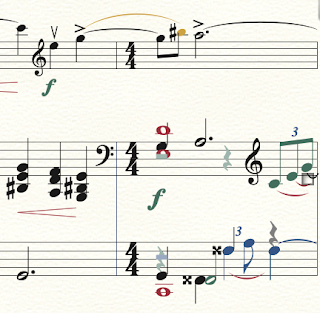 Proofing directly in Finale is inadequate because of the tool handles and the colors of the layers. I have some practical considerations that I would like to share here. I'm only a week into the process, so expect updates! 1. Using a foot pedal to turn pages does have a learning curve. 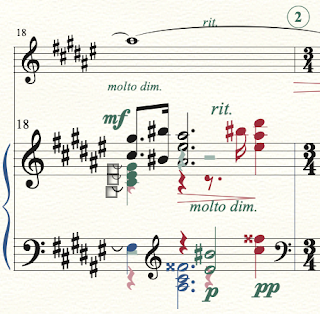 When making a PDF from a Finale (or other notation program) file, it is best to have the ends of the pages in places other than key changes, changes of register, clef changes, and changes of technique (like going from arco to pizzicato). 2. 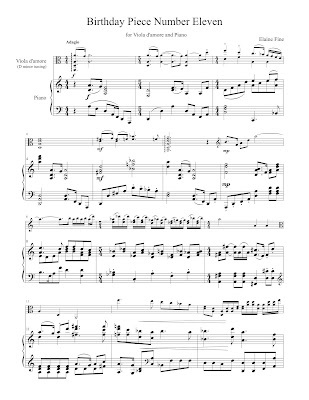 When you use Forscore for playing, the page-turning system doesn't work when the image is blown up to fill the screen completely. 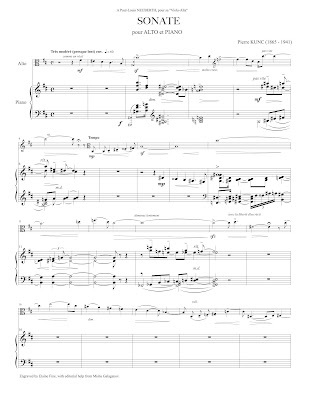 Since page margins are not an issue with music that doesn't need to bound, I have reduced my page margins to half an inch (and I guess I could even make them smaller) on either side. I have also increased my page size to as close to 100% as possible, because that makes the notes bigger. And who over the age of 50 doesn't prefer to read larger notes? 3. Use a bold font for fingerings. Maestro 14 point works for me. It does make a difference. 4. Get a soft external case that has a pocket to hold your page-turning foot pedal, so you can keep everything in one place. I even have a little plastic container of AA batteries stuffed in mine. 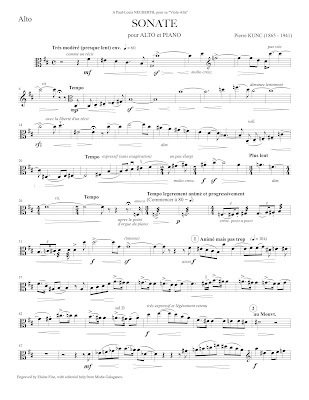 You can find the music on this page of the IMSLP. I'm having a moment of celebration here. 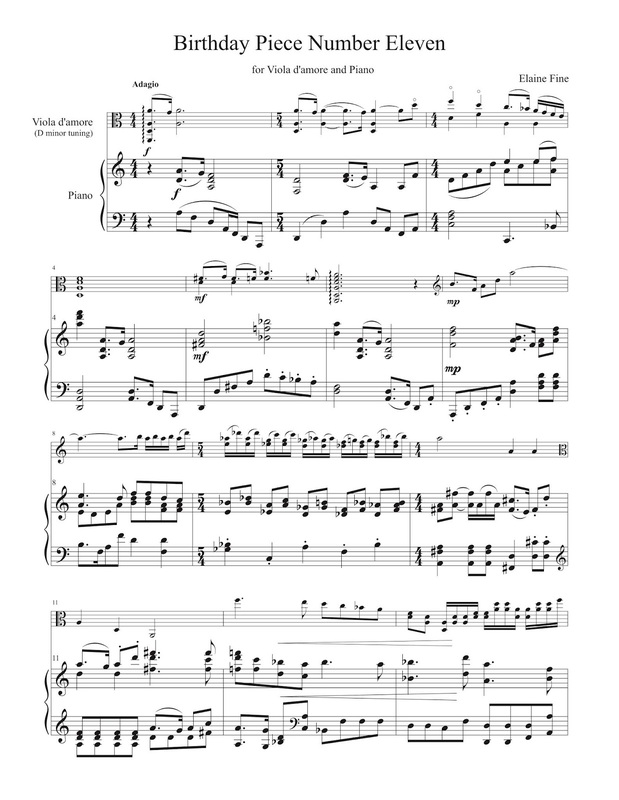 The first movement of the Viola Sonata (all 25 pages of it) is now engraved, and I have a PDF file (probably with a few errors) that I would be happy to send to any interested violists. And all violists should be interested . . .
Just send me an email, and I will keep you in the Kunc loop. Boy would I love to see this ballet! Stick around after the Bach because Legrand sings music from The Umbrellas of Cherbourg with Danielle Licari, the singer who dubbed Catherine Deneuve's voice in the film. Their singing is set against images from the film. 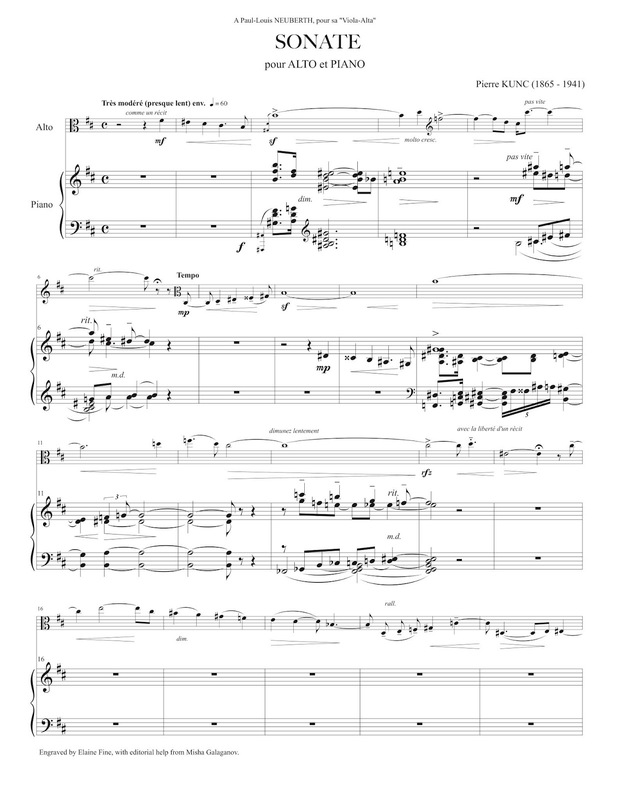 I spent much of my day re-working a string quartet arrangement of one of my favorite Legrand songs. Legrand reminds us that we must believe in spring. I keep believing in spring because of Michel Legrand. I am so thankful for his music. His was a musical life well lived. Last night the viola section of the Champaign-Urbana Symphony Orchestra had a wonderful moment (or rather, a wonderful half hour) playing Schubert's Fifth Symphony. And the viola section love spread itself throughout the orchestra (the heart is in the middle of the body--any body). Or maybe we were just responding to all the ebbs, flows, and unnamable subtle shadings that happen when everybody has an open heart and is really feeling the music. The Schubert love spread to the rest of the program too, particularly in Pulcinella. It was a very enjoyable concert to play, and to hear. There was more snow than predicted for our 50-mile trek home on a two-lane highway (we opted for the two-lane highway rather than the interstate because we didn't feel like driving with trucks, as we did the night before). There was snow falling from the sky and snow drifting all over the road. About five miles into our journey we noticed many flashing lights ahead of us, and it turned out to be a snow plow. It swept away the snow, salted our path, and provided light to guide our way. After about fifteen miles it went off to plow another rural road, and, like magic, another snow plow appeared directly in front of us. That plow led us about ten miles more, and then stopped to let us pass once its help was no longer necessary. I felt the spirit of Schubert all night. Sunday's concert has passed and John David and I have moved on to new repertoire. 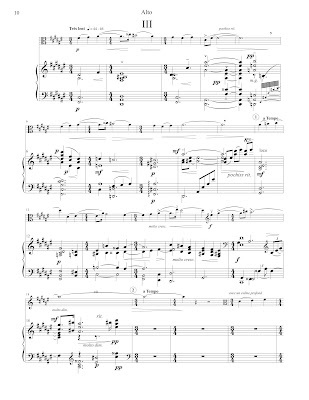 But I now have the piano score on my desk, and have been entering it into Finale and learning a great deal about piano writing (and about the piece!) in the process. I have also started questioning the sparse record of the lives of the Kunc family. It seems that Pierre Kunc's younger brother Aymé Kunc did not win the "second prize alongside Maurice Ravel" in the 1902 Prix de Rome. Aymé Kunc won the first prize that year. Ravel was, according to Arbie Orenstein, a finalist, but he did not win any prizes. The second prize went to Albert Bertelin, and the third prize went to Jean Roger-Ducasse. Aymé Kunc completed in the Prix de Rome four times before winning the Grand Prize (a generous four-year stipend and lots of fame). 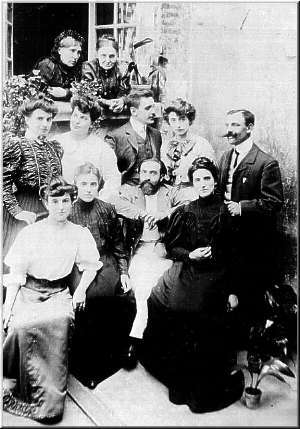 Ravel won the third prize in 1901. 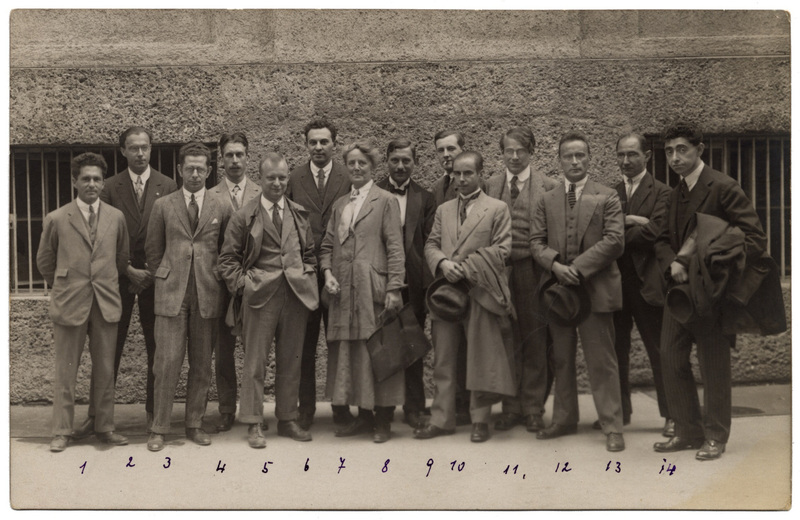 Ravel is a household name, and Aymé Kunc remains a footnote in Ravel's biography (and a thorn in his side). 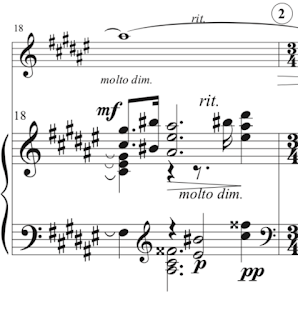 Aymé's work is not yet entirely in the public domain, but there is an entry for him in the IMSLP that has two pieces. There is an entry for Pierre Kunc (whose work is in the public domain) as well. And there's also an entry for Aloys Kunc, the father of Pierre and Aymé. I'll go back to my engraving work now. It is always an exciting experience to play viola and piano concerts, but the concert of long-neglected music that John David and I are playing tomorrow (see the posts about it below) is especially exciting because until tomorrow the only people to hear our program (aside from John David's son and daughter-in-law, who got a special preview performance a couple of weeks ago, and a group of people who heard the first movement of the Ashton in November) have been John David and me. The experience is kind of like planting seeds in a secret garden, tending the plants, watching them flower, and, suddenly, as if by magic, seeing them burst into fruit. Tomorrow we plan to harvest our fruit and share it with whoever happens to come to the concert. The one thing I know for sure is that we both love these pieces (to pieces), and we are both very eager not to keep their secrets and charms to ourselves any longer! It is just amazing how a bow that is perpendicular to the string can make even an automated violin (or set of violins) sound human! The finger levers are powered by small bellows, and the wheel is made from 1,300 horse hairs. There is a lot you can learn about 19th-century style from this interpretation, once you remove your lower jaw from the floor. Someone posed a question on Reddit wondering if anyone had "out-of-body" experiences playing Bach. So this one time in a rehearsal space I was playing Bach's Cello Suite #1 in G Major on the marimba. I had been rehearsing it for weeks, thinking constantly about how I felt about the piece and what it meant to me in order to put my very own emotional spin on it. I probably played it at least 20 times a day for three weeks. I started the piece for the umpteenth time that practice session... and then when I finished I came out of some weird trance or something: I had no memory of playing the piece, but I did have a... well, like a vast and empty, yet fulfilled, place inside of me. I remember knowing that I had played well, but that's it. It was a weird experience, and I'm still not sure what happened. The best way to describe it would be from Matilda by Roald Dahl "It made me feel lovely,' Matilda said. 'For a moment or two I was flying past the stars on silver wings." What are your out-of-body experiences with playing Bach? What is it about Bach that facilitates these experiences in our brains? Is music math, and math music? Is there truly music in the spheres? Or is it just that repetition encourages deep meditation? Let's talk! But mostly I want stories about 'going somewhere else' while you were playing Bach. DAE? My question is how do you tell an out-of-body experience from an in-body experience? Bach is my "go to" when I have feelings I cannot otherwise process. My mind can follow the pathways and accept their logical (and often surprising) destinations. The process of following them helps me to feel clearer about taking whatever next step I need to in any given situation. His choices bring me satisfaction. 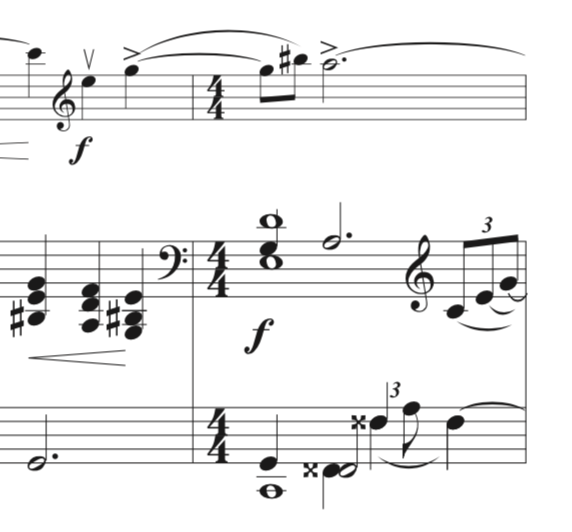 There are moments in Bach pieces I heard my father playing while I was growing up that bring me "right back" to a moment and a physical place in my childhood. 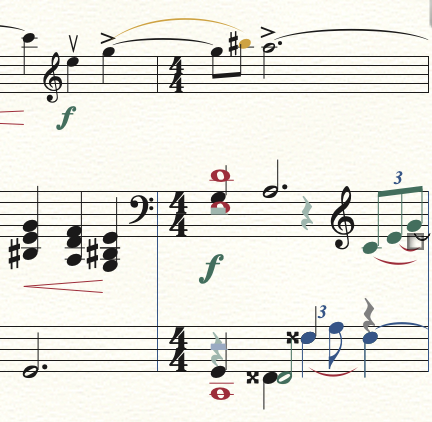 There are pieces of Bach that generate almost a "taste" in my mouth (Cantata 78 is one). There are pieces of Bach that do the opposite of an "out of body" thing for me. They make me feel more physically grounded, more comfortable in my skin, more able to move, and more secure. I would not say that Bach is "music of the spheres" because I believe that Bach draws upon things that are very physical. The way Bach feels under the hand, the way it feels to sing Bach, and the way his long phrases are like physical constructions make me venerate Bach for his deep humanity. I play Bach every day. 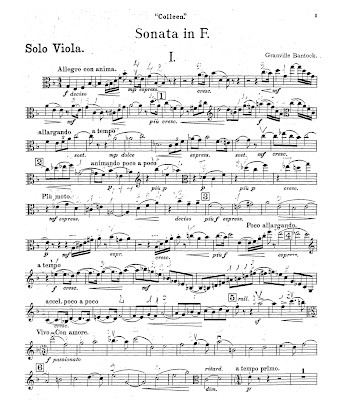 Since I play viola, I alternate between the Sonatas and Partitas and the Cello Suites. My daily routine involves the reward of playing Bach after I play my scales. And for a while (maybe a year or so) I was going through the WTC on a daily basis. 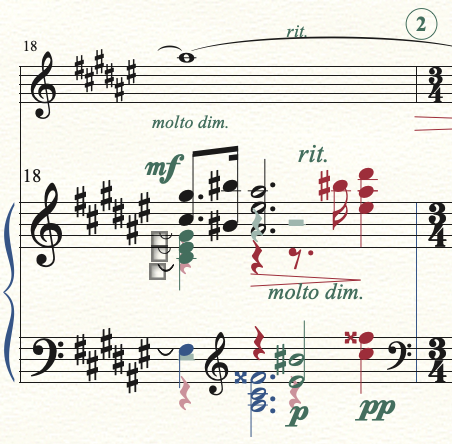 These days when I have time at the keyboard I have been playing the Partitas. In addition to the Viola Sonata by Algernon Ashton, John David Moore and I will be playing Pierre Kunc's Viola Sonata on our January 20th concert. We got hold of the music purely by accident. John David requested something from interlibrary loan, and the Kunc Sonata came in its place. I like to think that a savvy librarian knew that we would like the piece and that we would perform it. That librarian was right! There is close to nothing written about Pierre Kunc in English, but I did come across a French webpage dedicated to Kunc. I brushed aside the huge number of names dropped in this article, and learned that Pierre Kunc was the third of twelve children who were part of one of the most important musical families in France. He had several celebrated teachers, including his parents and the violinists Paul Viardot (the son of Pauline Viardot), and Charles de Beriot (the husband of Pauline Viardot's sister Maria Malibran). 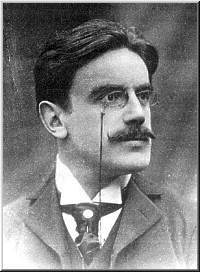 In spite of being overshadowed by his younger brother, Aymé, who won the Grand Prize in the 1902 Prix de Rome, Pierre Kunc had a great deal of success in France. From 1899 until 1925 he taught piano and organ at the Ecole Sainte-Genevieve in the rue Lhomond in Paris, and he held several important organ positions including one at Notre-Dame of Bercy in Paris and one at Saint-Suplice, which was also in Paris. He also served as the choirmaster at the Monte Carlo Opera, and in 1909 the Institute de France gave him the Prix Trémont. His work has fallen into obscurity because so little of his music was published. 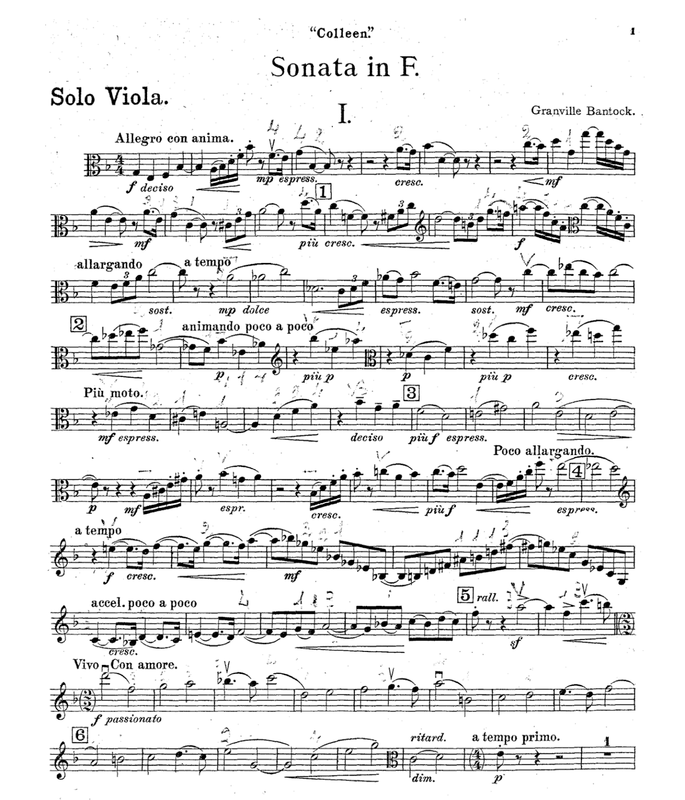 This Viola Sonata and his Rapsodie, also written for viola and piano, were Pierre Kunc’s only pieces of chamber music to see publication. Kunc wrote his Viola Sonata for Paul-Louis Neuberth to play on his “Viola Alta,” a nearly 19-inch viola with proportions more like that of the violin. The instrument was developed in the 1870s and was abandoned (probably because of its unwieldly size) in the early 1920s. 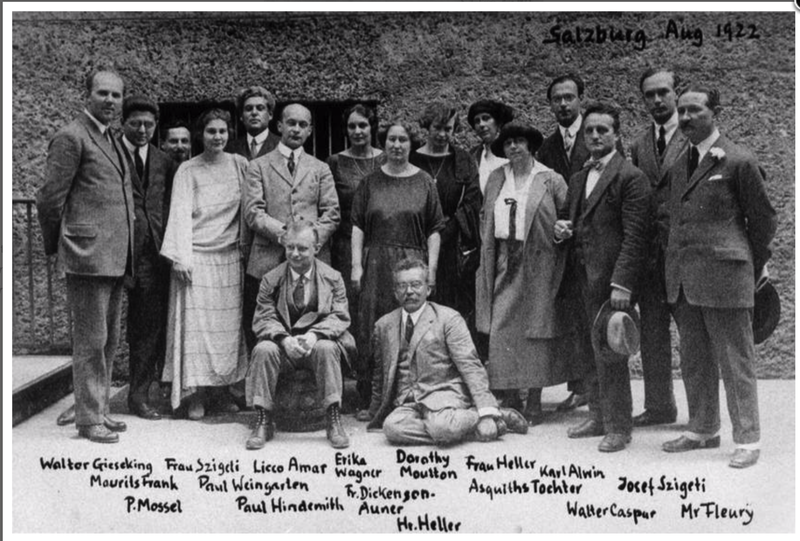 The work was completed in 1921, and Neuberth gave the first performance in 1922 with the pianist Rachel Blanquer. 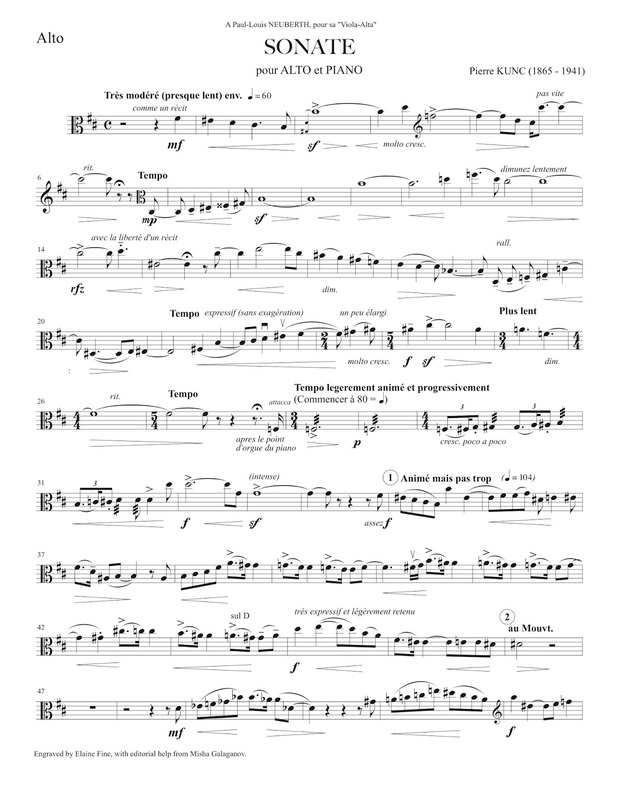 I made a new edition of the viola part and uploaded a PDF into the IMSLP. After this concert I will start the piano part, which I hope to have completed by March or April. My hope is that our performance will be the first of many! Since leaving Facebook I have been exploring new online musical worlds. As a result of my exploration I have found treasure troves of musical discussions through reddit. Some of those wise musicological voices that used to comment here in the blogosphere seem to have migrated to the classical music groups there. Reddit reminds me of the usergroups that I used to take part in before the blogosphere was invented. I enjoy reading posts from young people, people new to "classical music," and people with questions that provoke interesting answers. It is, as far as I can tell, a "place" where discussion is both anonymous and civil. I'm still learning my way around this new way of using the internets. I love the repeat sign graphic in the upper lefthand corner, and if you look down at the bottom left you will see a sharp sign and a flat sign that replace the usual up arrow and down arrow (which allows users to anonymously up-vote or down-vote a post). Very clever. 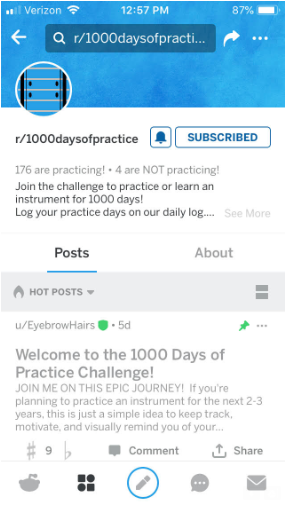 The name of the subreddit is also appropriate because it improves upon "100 days of practice" meme that young musicians use to keep themselves motivated. Anyone learning to play an instrument knows that a mere hundred days of practicing is not going to get you very far on a journey towards proficiency. One thousand days of consistent practice is a healthy commitment. John David and I are playing a concert later this month that will include Algernon Ashton's Viola Sonata. Algernon Bennett Langton Ashton was born in Durham, England in 1859, and moved to Leipzig with his family at the age of four. At the suggestion of Ignaz Moscheles, Ashton entered the Leipzig Conservatory, where he studied with Carl Reinecke, Ernst Richter, Salomon Jadassohn, Benjamin Papperitz, and Theodor Coccius. He graduated in 1879, and entered the Hoch Conservatory in Frankfurt where he studied with Joachim Raff. Ashton settled in London, and taught piano at the Royal College of Music from 1885 until 1910. He died in 1937. In addition to being a prolific composer, Ashton kept a 58-volume daily diary. 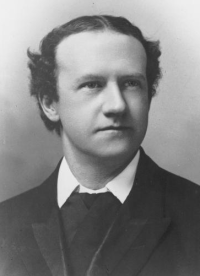 He was famous for finding graves of distinguished people and writing letters to the Musical Times to comment on the condition of the gravestones. These letters were published in two volumes by Chapman & Hall (Truth Wit and Wisdom, and More Truth Wit and Wisdom), but his diaries were lost. Ashton's 160 published works include four cello sonatas, three violin sonatas, two piano quintets, eight piano sonatas, works for choir, songs, salon pieces, and fantasie pieces. Many of his unpublished works, including 24 piano sonatas, one in each key of the chromatic scale, 24 string quartets, and four symphonies are believed to have been destroyed when German bombs hit his family home during the Blitz. Here's a link to his Fourth Piano Sonata, Opus 164 and a link to one of his Phantasiestucke, Opus 12. Michael and I were extremely impressed by Alfred L. Werker's 1949 film Lost Boundaries. I offer no spoilers, just a sincere recommendation and a YouTube link. The music, written by the Canadian film composer Louis Applebaum (1918-2000), is exceptional.